Couch potatoes who can’t take their eyes off their favorite TV programs are now given an alternative by VIZIO, America’s top LCD HDTV company. It has introduced a mobile television which they can carry along when they are travelling. 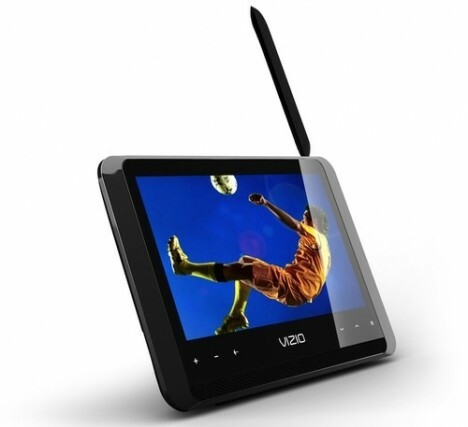 VIZIO has rolled out three new Mobile Razor LED models, 7″ VMB070, 9″ VMB090 and 10″ VMB100, with less than an inch thick that are able to receive ATSC and NTSC broadcast signals even when operating in a moving environment. Besides, the 9″ VMB090 and 10″ VMB100 Mobile Razors are also able to receive the new ATSC-M/H signals through an integrated antenna. The 7” display VMB070, 9” display VMB090 and 10” display VMB100 are tagged at $149.99, $199.99, and $229.99 respectively. The slim and stylish mobile Razor LED TV series offers image quality at resolutions of 800×480 pixels and brightness at 250 nits (for 7″ VMB070) and 350 nits (for 9″ VMB090 and 10″ VMB100). The sleekly designed mobile TV series are buttonless and controllable via its sensitive touch-screen feature. Both the 10″ VMB100 and 9″ VMB090 Mobile Razors feature an additional HDMI 1.4 input, composite inputs, a headphone jack and a USB port for users to listen to MP3 audio, view images, etc.